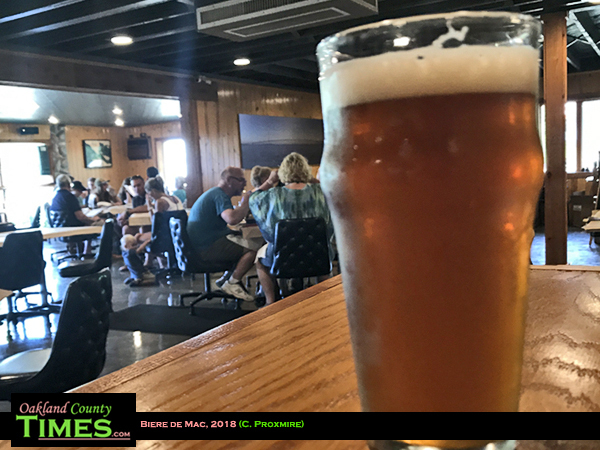 Mackinaw City, MI – If you’re heading up to the Mackinaw City/St. 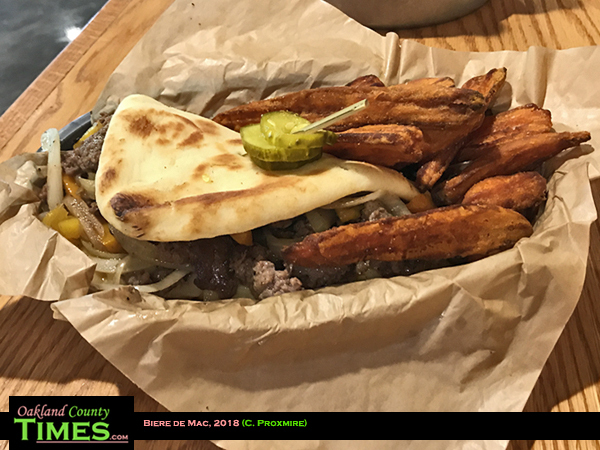 Ignace Area this summer, it can be hard to decide on a great place to eat. 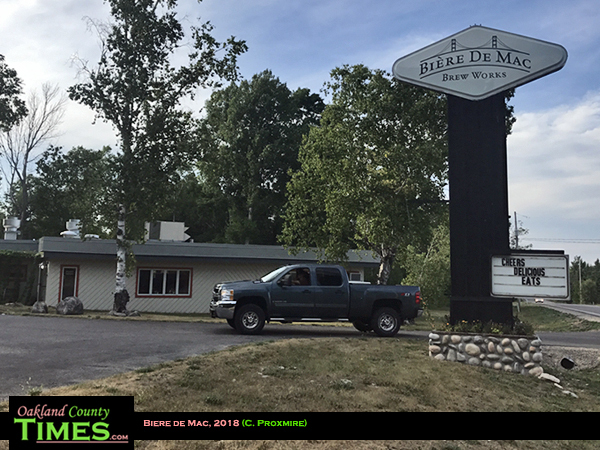 My favorite Straits Area writing spot is the Biere de Mac Brew Works, located at 14277 Mackinaw Hwy in Mackinaw City. First off, they have plenty of nice big tables and super-fast wireless, which is essential for a writer on the go. But mostly they are known for their small-batch beers that are brewed on site. Many have names that resonate with the locals. 49 Fathoms, a big-bodied sweet milk stout with complex flavor, is named because the deepest place in the Straits of Mackinac is 49 fathoms. The Nicolet Rye IPA is named after a French Explorer who documented journeys around Lake Michigan and “discovering” Mackinaw Island. The Mackinaw Sunrise is an obvious one. There is even a beer called the Yugo, which is distinctly light, just like the only car to blow off the Mackinac Bridge. On my most recent, my dining companion had a Pale Ale called the De-Bliss-Cious, named after a town that is South West of the Straits. Since I’m not a beer-drinker I had a refreshing glass of lemonade. In the past I’ve had their Mighty Mac and Cheese, which is indeed mighty with Bacon Lardon, Plath’s Smoked Polish, Butternut Squash, White Cheddar Cheese Sauce, Parmesan Toasted Bread Crumb. 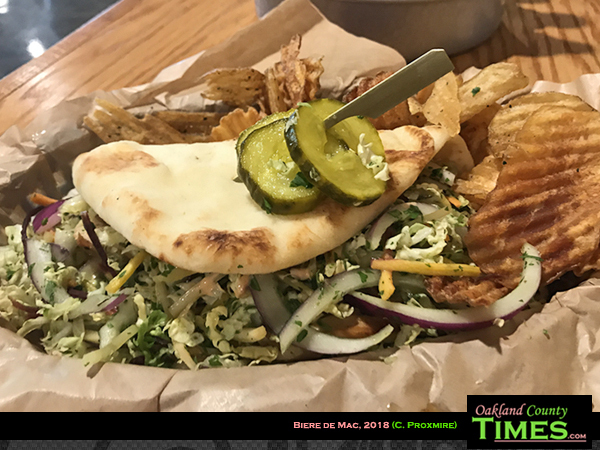 For this visit though we opted for Naan bread sandwiches. I had the Mackinaw Cheesesteak which was stuffed with shredded ribeye, sautéed peppers and onion and melted white cheddar. My friend had the Asian Chicken with seared slices of chicken breasts that had been ale-brined with ginger and soy, topped with avocado, Asian cilantro slaw and Siracha mayo. Both were delicious. It was also fun meeting the owner George Ranville. He and his son Danny opened the brewery just last year and it’s been gaining recognition among the locals and visitors. Originally from Grand Rapids, they wanted to bring the art of craft brewing to their vacation area. Learn more about this up north destination at http://bieredemac.com.